What a year it’s been for social media marketing! This year’s campaigns have been more extra than ever–extra fun, extra user-friendly, extra engaging, and, for some, extra controversial (lookin’ at you, Nike and Snapchat). In part one of this two-part mini-series, we’re taking a look at our ten most favorite campaigns of the year and why we love them. In 2016, Instagram made shopping through the platform easier by adding capabilities to shop directly from a post. When Wayfair found out, they took advantage of the new tools and went to work. Soon their Instagram was filled with snazzy, well-staged photos of their favorite products that you could (surprise!) purchase directly from the ad by clicking the ‘buy now” which takes shoppers to Wayfair’s checkout page. 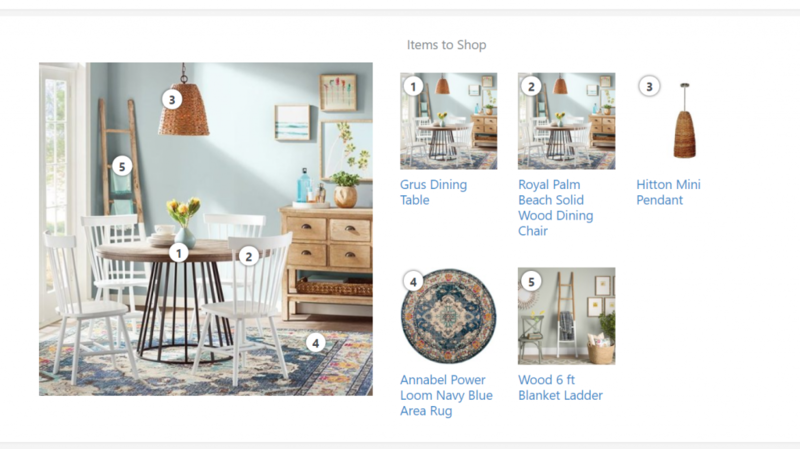 Wayfair sets the bar for other retail brands by making their shopping experience as seamless as possible for customers through creative marketing techniques and by not being afraid to use the latest social media tools to improve their customer experience. Their courage paid off, too. The number of shoppers clicking through to their website via social media tripled from the previous year. If there were awards for trolling, Wendy’s would easily take home the prize in the fast-food chain category. Wendy’s fired the first shots during a Super Bowl ad that called out McDonald’s for promoting serving flash-frozen beef on their website. Then, Wendy’s carried the battle to Twitter where they continued to destroy MickeyD’s for their frozen beef antics. 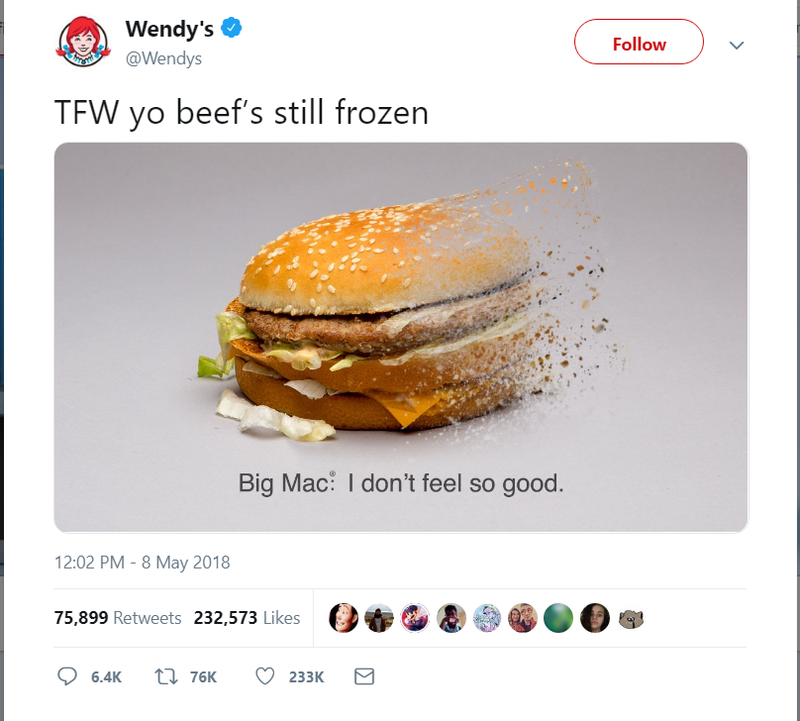 In the tweet below, Wendy’s uses the hype from Avengers: Infinity War movie to take a snap (pun intended) even Thanos himself would be proud of. 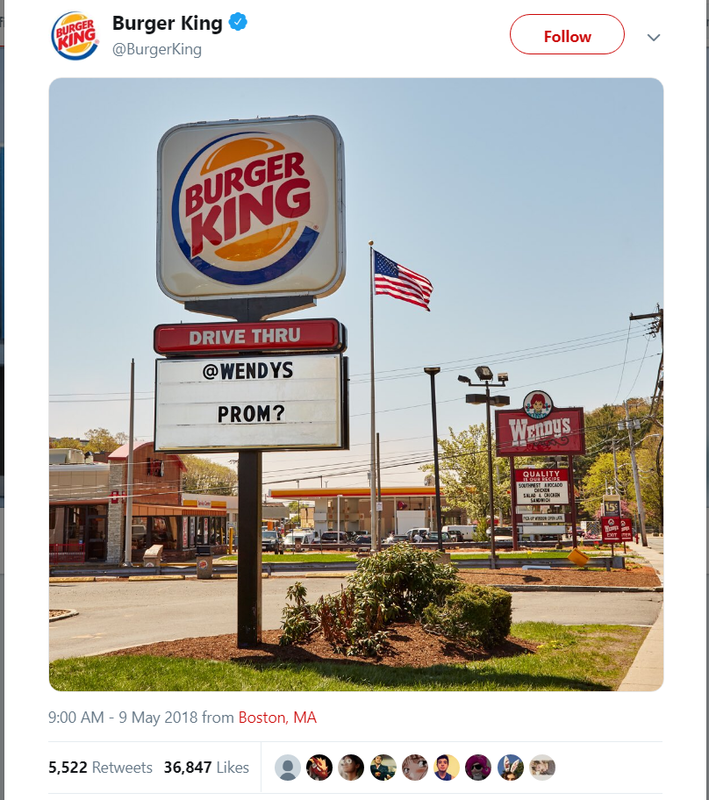 In May, Burger King began their own trolling game with Wendy’s by asking their competitor to prom in a hilarious Twitter thread that you can check out here. 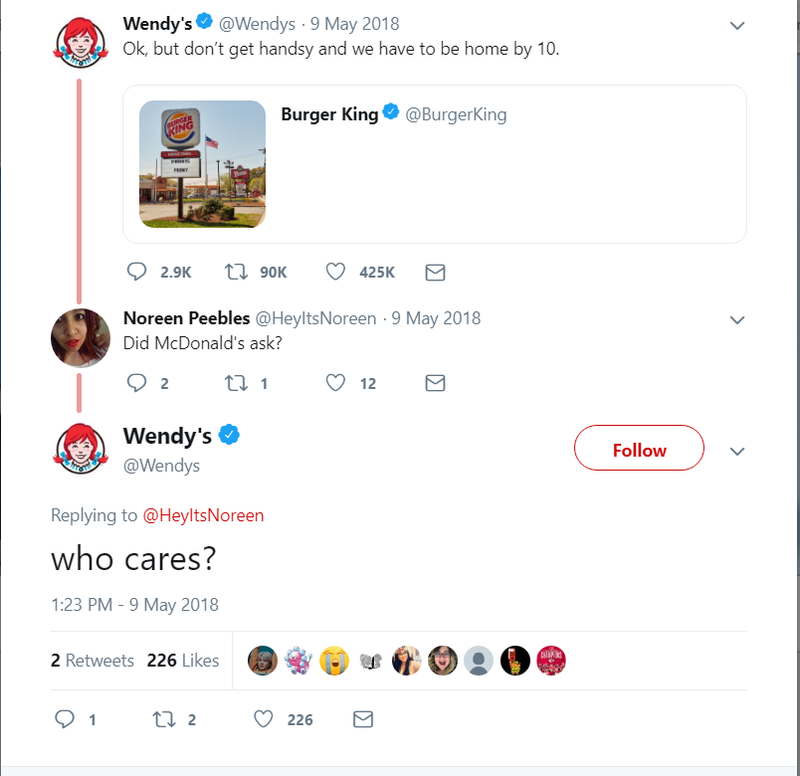 Though BK tried to distract Wendy’s from trolling the golden arches with their own Twitter war, Wendy’s wasn’t ready to let go of their war with McD’s and fired another shot when the opportunity arose in their BK prom thread. 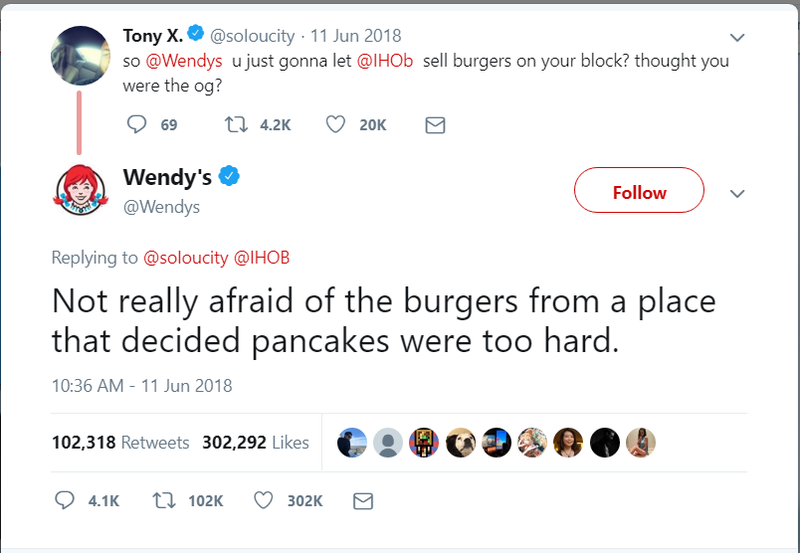 And when their ongoing crusade against McDonald’s wasn’t enough to satisfy their trolling urges, Wendy’s joined the fray against IHOP in the now-infamous summer campaign in which the pancake house temporarily changed its name to IHOB to promote its new steakhouse burgers. We’ll talk more about that one later. Who knew that a toilet paper company would be named by Time magazine as the “sassiest brand on Twitter”? Well, if you followed Charmin on Twitter, you did. 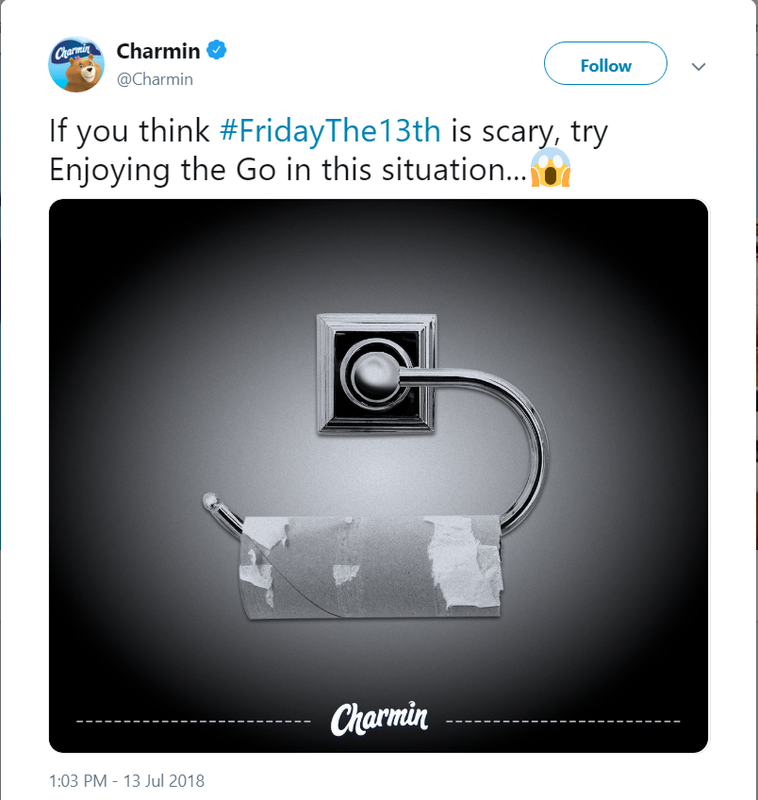 Using hashtags like #tweetsfromtheseat, #enjoythego, and #Tuesdaythoughts, Charmin has found funny, clever and, yes, sassy ways to convince us they’re the most intriguing toilet paper brand around. When the former direct to consumer makeup and skincare brand decided to expand their efforts by opening two brick-and-mortar stores and pop-ups this year, they had Instagram in mind. The opening of their second brick-and-mortar shop in Los Angeles garnered much fanfare thanks to the makeshift “Glossier Canyon” built inside along with a mirror so shoppers have the perfect background for an Instagram-worthy selfie. Their goal was to become the most Instagrammed store in Los Angeles and they pulled out all the stops to make it happen. Mission accomplished, Glossier. 2018 was definitely a year for women to defy standards and rebel against social injustices against females so it came as no surprise when Olay, a major skin care and makeup brand, launched a campaign based on women defying social norms. The #FaceAnything campaign worked for a number of reasons, perhaps the most important reasons being that the campaign was timely and relevant to the issues women face in society and featured the faces of strong women who are also movers and shakers in their industries. A continuance of their long-running “You’re Not You When You’re Hungry” campaign, Snickers’ 1 for 2 ads offered 1 Snickers candy bar for the price of 2. When viewers clicked on the ad, Snickers politely asked, “Are you okay?” before reminding us that we’re not ourselves when we’re, you guessed it, hungry. This campaign was a smart way to refresh a successful but longstanding campaign. Who says data has to be boring? In 2018, Spotify showed us all how user data could be turned into the perfect marketing campaign with the streaming service’s fascinating and downright hilarious campaign, #2018Goals. 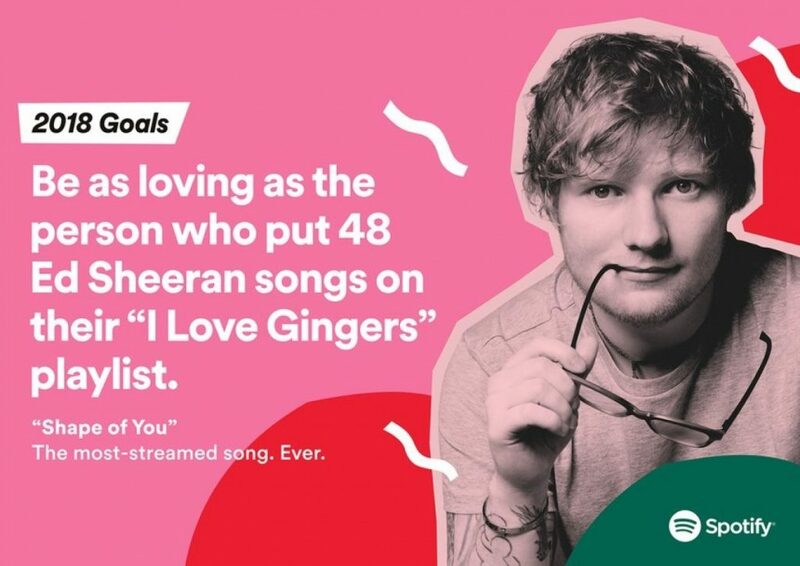 The campaign dolled out advice like “Be as loving as the person who put 48 Ed Sheeran songs on their “I Love Gingers” playlist or “Take a page from the 3,445 people who streamed the ‘Boozy Brunch’ playlist on a Wednesday this year.” The campaign coincided with their “3 Months of Premium for 99¢” offer and helped Spotify stocks see a significant rise over the year. This campaign is a bit different from the others in that it’s actually a running Instagram page from Chicago’s famous specialty beer shop dedicated to pictures of all of the sweet doggies who visit the store with their owners. What makes this campaign stand out to us is that it is used to promote events by Bitter Pop that benefit animal rescue including Santa Paws events during Christmas and “Hopslam Yoga”, an event benefiting a personal animal rescue by one of the shop’s employees. The campaign shows that brewski-lovers are also big softies with a heart for animals, which makes the brand more endearing to followers. Who says a pizza chain can’t make an actual difference in Smalltown, USA? 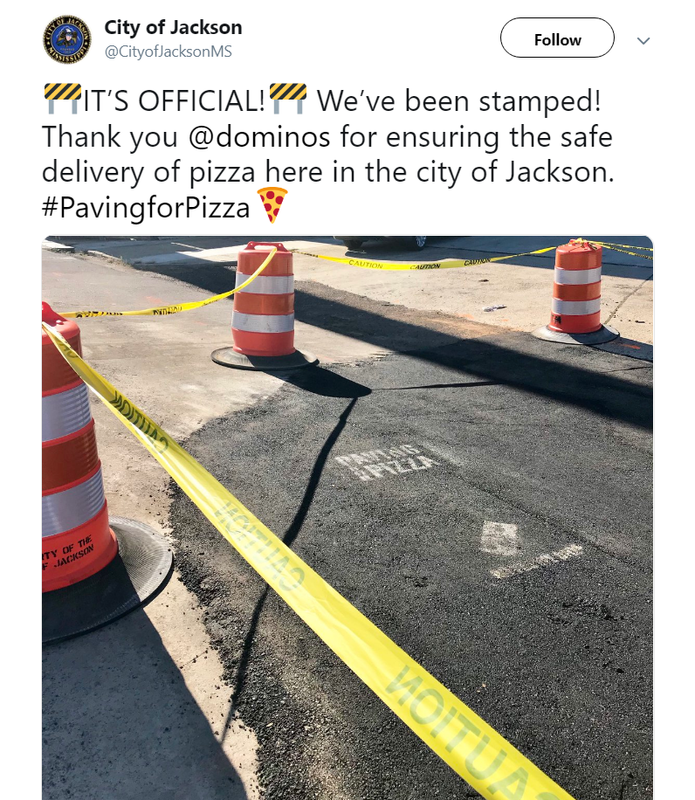 Dominos proved they could and did do just that with their Paving for Pizza campaign in which they encouraged customers to ensure their pizza would always arrive home safely by nominating their town to have potholes paved by the pizza company. Sure, that should be a job for local government but if you’re from a small town without a lot of resources for road work you know how hard it can be to get bad roads repaired. This campaign showed viewers that Domino’s does actually care about doing their part to improve the lives of everyday Americans and their towns. Okay, so this campaign wasn’t created by Marvel/Disney (or was it?) and it doesn’t actually promote anything that’s happening in real life (or does it?) 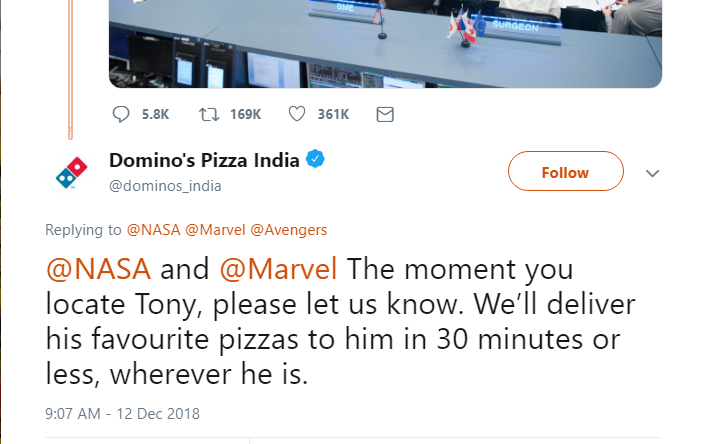 but it did avalanche into a nationwide social media craze that involved everyone from NASA to Domino’s Pizza, and all for the benefit of a fictional character. 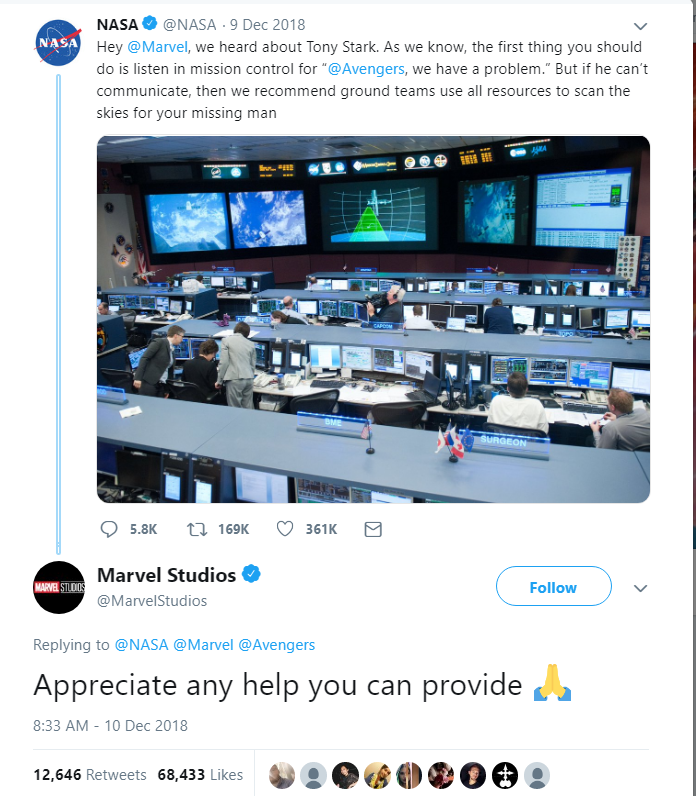 Perhaps this campaign was cooked up by overzealous fans, or maybe it was covertly sparked by Disney as a creative way to promote their upcoming Avengers: Endgame movie. 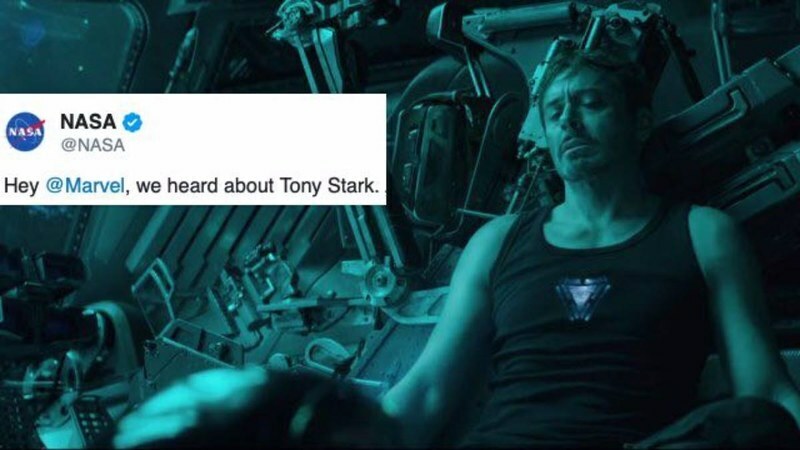 Even if Disney had nothing to do with the campaign, they’re all but guaranteed to reap the benefits when Endgame hits theaters this April. To be honest, narrowing this list down to only 10 campaigns was kind of tough. The social media marketing campaign game is stronger than ever and the competition is thick. That being said, we would like to give a nod to the following brands for their standout campaigns. Nike’s Believe in Something. 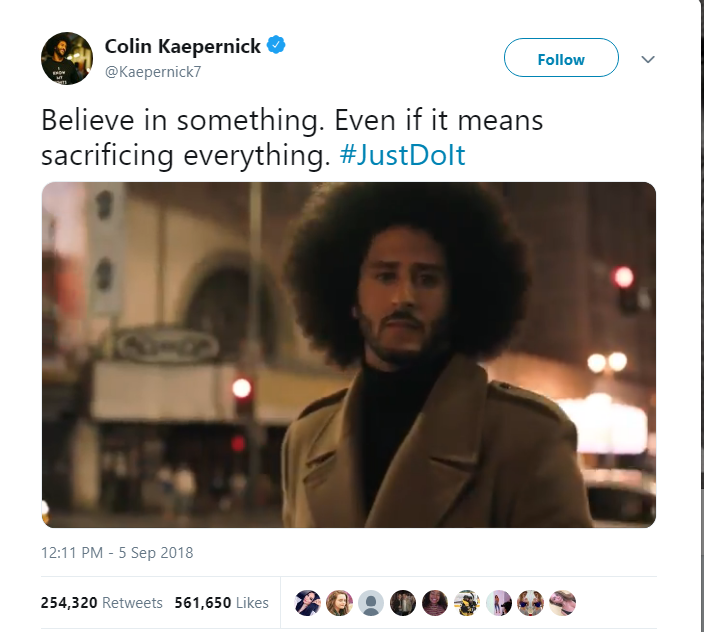 No matter what side you stand on regarding Nike’s decision to feature the controversial Colin Kaepernick in last fall’s “Believe in Something” campaign, you have to agree that the move garnered a ton of publicity for the sportswear brand. Read why marketers considered the campaign a success here. ASOS’s As Seen on Me. For a time this year, ASOS social media followers could see the brand’s clothing on everyday people and shop looks worn by customers through shoppable images on their Instagram page and website. The photos were taken by real-life customers and tagged with #AsSeenonMe. ASOS then made the photos shoppable with Instagram’s new shoppable ad tools and a beautiful campaign was born. Though you can no longer shop the images, you can still view fellow ASOS lovers wearing their favorite styles by searching the AsSeenOnMe hashtag. IHOP’s IHOB Campaign. 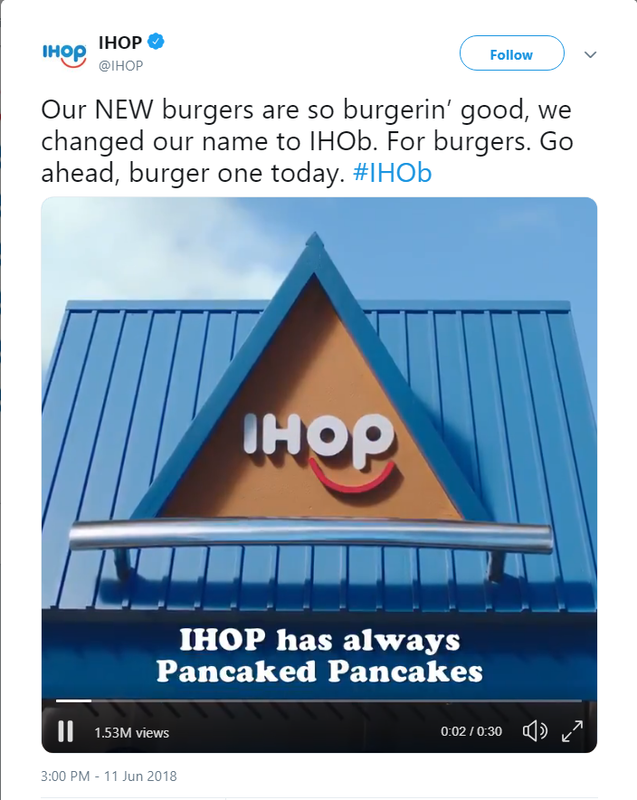 Sure, this campaign left many of us scratching our heads but one thing’s for sure–IHOP’s campaign to promote their new burger menu definitely drew a ton of attention from customers and competitors alike. Levi’s Time to Vote. 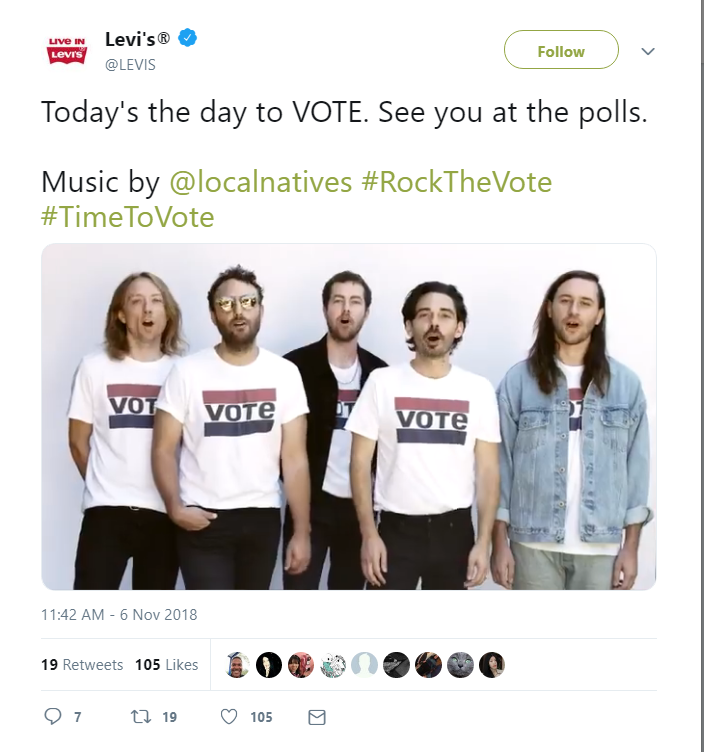 By now you know that the 2018 midterm election was one of great significance to the nation’s current political climate and public figures everywhere were doing their part to encourage citizens to exercise their right to vote in November, including America’s oldest jean company, Levi Strauss. 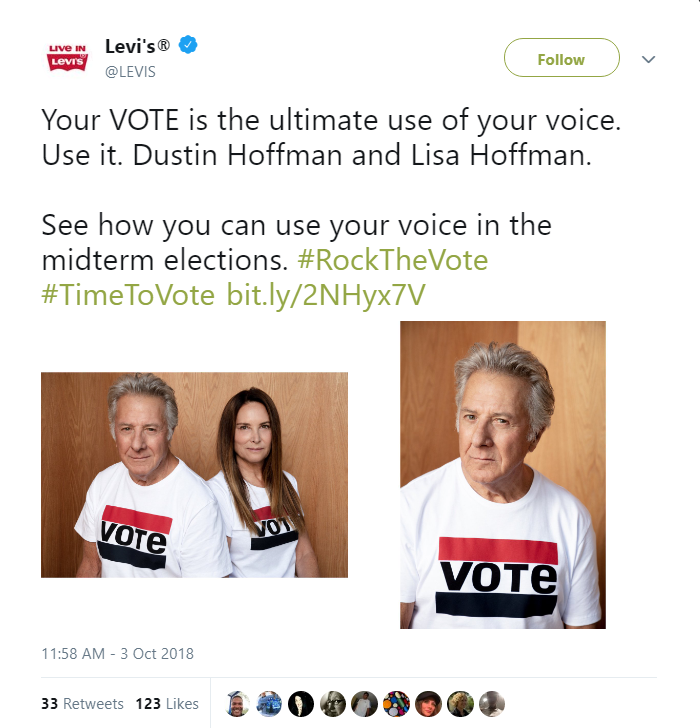 The denim company promoted #TimetoVote with help from the likes of Dustin Hoffman and other various actors and recording artists and Levi’s backed their campaign by giving corporate employees five hours and store employees three hours of paid time off to vote during 2018’s November Election Day. The campaign reminded us of our civic duty to vote and encouraged us to wear our Levi’s while doing it.